After cementing his local legacy with memorable loops at Club Campestre and Puerto Los Cabos (a joint effort with Greg Norman), Jack Nicklaus recently unveiled what may be his crowning Los Cabos achievement: Quivira Golf Club, a stunningly beautiful 7,139-yard layout named for one of the lost cities of gold sought by 16th-century explorer Francisco Vázquez de Coronado. Nicklaus, the greatest player in the history of golf, is working on an equally illustrious career as a course designer. The "Golden Bear," as the 18-time major champion is popularly known, has now designed hundreds of top-ranked layouts around the globe, including far-flung locales on six continents. But he's held in particularly high esteem in México, where his personal imprimatur has become synonymous with golfing excellence and the luxurious lifestyle available to affluent visitors in the country’s premier coastal resort destinations. Nicklaus almost single-handedly spearheaded the Los Cabos golfing boom in the 1990s, crafting a trio of superb courses – Palmilla, Cabo del Sol’s Ocean Course and El Dorado – along the tourist corridor that connects cape cities Cabo San Lucas and San José del Cabo on the southernmost rim of the the Baja California peninsula. 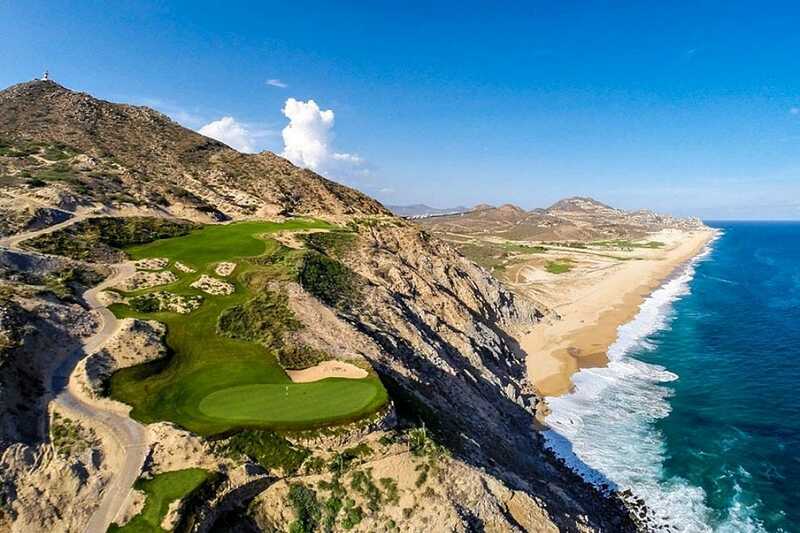 Although other golfing greats have since followed in his footsteps – including Norman, Gary Player, Tom Weiskopf, Davis Love III and even Tiger Woods – Nicklaus Design remains the gold standard in Baja California Sur. Is Quivira Golf Club, which opened in December 2014, his masterpiece? Nicklaus seems to think so, stating simply: “Our team worked with the canvas Mother Nature provided to create one of the most spectacular courses in the world." As does GOLF Magazine, which named Nicklaus “Architect of the Year” and Quivira “Best New International Course” in its January 2015 issue. The genius of Quivira is that it doesn’t attempt to tame nature, but rather enhances the majesty of the surrounding area. Sculpted holes hug sheer cliffs, parallel golden sand beaches and wander windswept dunes and rolling desert foothills. The glittering blue waters of the Pacific Ocean are a constant presence. In fact, Quivira boasts more oceanfront exposure than any other course in Los Cabos, with seven holes along the coast, and Pacific views on all 18 holes. Despite a delayed opening due to Hurricane Odile and early concerns about the course’s playability for high handicappers, Quivira is in pristine condition, and the course offers an enjoyable experience for players of all skill levels (with staggered tee boxes from 4,731 yards). That’s not to say, however, that there aren’t plenty of challenges. Jaw-dropping scenery like breaching whales foregrounded by a historic lighthouse can play havoc with one’s concentration. And despite Nicklaus’ non-interventionist design style, trademark touches like forced carries, frequent elevation changes and abundant bunkering demand constant vigilance. Like many of Los Cabos’ signature golf courses, Quivira is rich in amenities. A practice area parallels the ocean, with a sizeable putting green and a handicap lowering short game area. Comfort food stations are scattered around the course, with refreshments ranging from rim-salted margaritas and Bloody Marys to burritos and ham and cheese croissants. And the tropical thatched-roof clubhouse hosts a congenial bar, perfect for reliving the most memorable moments of your round, as well as an onsite steakhouse for meatier, more filling fare. Tee times at Quivira are open to guests at all four of Pueblo Bonito’s Los Cabos-based resorts – Blanco, Rosé, Pacifica and Sunset Beach – as well as owners at luxury residential developments Quivira, Copala, Montecristo Estates and Novaispania. The Quivira (pronounced key-vee-ra) residential development, for which the golf club is named, is an exclusive 1,850-acre, master-planned community from Pueblo Bonito owner and founder Ernesto Coppel Kelly. Complimentary shuttle service is provided from Quivira residences to the course. Pueblo Bonito is currently offering a “Play More & Save” program that showcases its first-class ocean and seaside accommodations and world-class golf access. Packages allow visiting golfers to play multiple rounds with progressive discounts, and they include greens fees, golf carts and all food and beverages available at the four comfort stations located around the course.